Everybody is familiar with the term “trading”. Most of us have traded in our everyday life, although we may not even know that we have done so. Essentially, everything you buy in a store is trading money for the goods you want. At tradimo you will learn how to trade the financial markets online – but exactly what is online trading? This article will give you an understanding of how trading can be defined and how online trading works. The term “trading” simply means “exchanging one item for another”. We usually understand this to be the exchanging of goods for money or in other words, simply buying something. When we talk about trading in the financial markets, it is the same principle. Think about someone who trades shares. What they are actually doing is buying shares (or a small part) of a company. If the value of those shares increases, then they make money by selling them again at a higher price. This is trading. You buy something for one price and sell it again for another — hopefully at a higher price, thus making a profit and vice versa. But why would the value of the shares go up? The answer is simple: the value changes due to supply and demand – the more demand there is for something, the more people are willing to pay for it. The term trading means exchanging one item for another. In the financial markets, you either buy something for one price and sell it again for another, hopefully at a higher price for a profit, or you sell something for one price and buy it again for another, hopefully lower price for a profit. We can explain this using a simple everyday example of buying food. Let’s say you are in a market and there are only ten apples left on a stall. This is the only place where you can buy apples. If you are the only person and you only want a couple of apples, then the market stall owner will most likely sell them to you at a reasonable price. Now let's say that fifteen people enter the market and they all want apples. To make sure that they will actually get them before the others do, they are willing to pay more for them. Hence, the market stall owner can put the price up, because he knows that there is more demand for the apples than supply of them. An increase in demand means an increase in price. 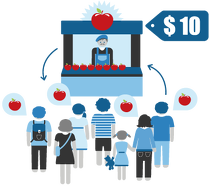 For example, if a market stall owner is selling apples, and more people enter the market, he may raise the price because these customers are willing to pay to make sure they can get an apple. Once the apples reach a price at which the customers think they are too expensive, they will then stop buying them. When the market stall owner realises that he is not selling his apples anymore because they are too expensive, he will stop raising the price and it may come back down to a level, at which customers will start to buy the apples again. Let’s say that suddenly another market stall owner comes into the market and has even more apples to sell. The supply of apples has now increased dramatically. It stands to reason that the second market stall owner may want to sell apples at a cheaper price than the first stall owner to entice customers. It also stands to reason that the customers would probably want to buy at the lower price. Seeing this, the first stall owner will most likely bring his prices down. The sudden increase in supply has therefore brought the price of the apples down. The price at which demand matches supply is called the “market price”, i.e. the price level at which both the market stall owner and the customers agree on both a price and number of apples sold. An increase in supply means a decrease in price. For example, if another market stall owner enters the market, there are now more apples for the customers. The first owner may drop his price to entice those customers to his stall. The concept of supply and demand is the same in the financial world. If a company posted some great results and is paying very good dividends, then more people want to buy the shares of the company. This increased demand will lead to an increase of the price of those shares. For a long time financial trading was purely conducted electronically between banks and financial institutions. This meant that trading in the financial markets was closed to anyone outside of these institutions. 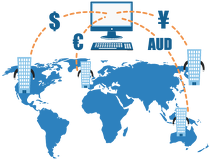 With the development of high speed Internet, anyone who wanted to become involved in trading was able to do so online. Almost anything can be traded online: stocks, currencies, commodities, physical goods and a whole host of other things – at this stage, you do not need to worry about all of these. For now, just keep in mind that if something can be traded, it will be traded. Out of all of these markets, the forex market is the largest. Almost $4 trillion worth of currency is traded every single day – this is bigger than any stock exchange anywhere in the world.